I have always been an activist, seeking to improve society. 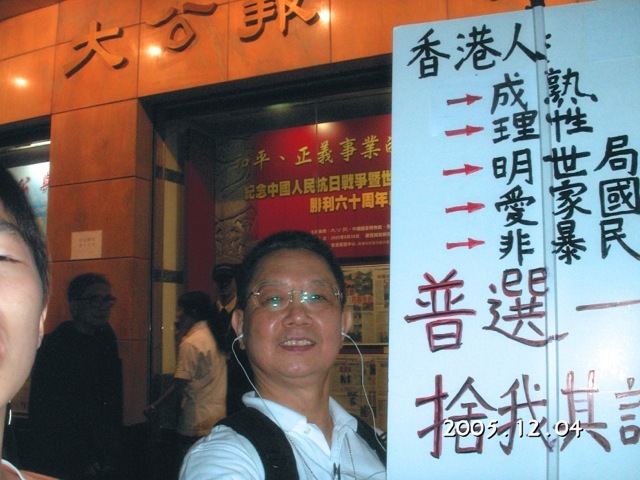 After I moved with Sally to Hong Kong to work for the Chinese University of Hong Kong (中文大學), I continued to be active. 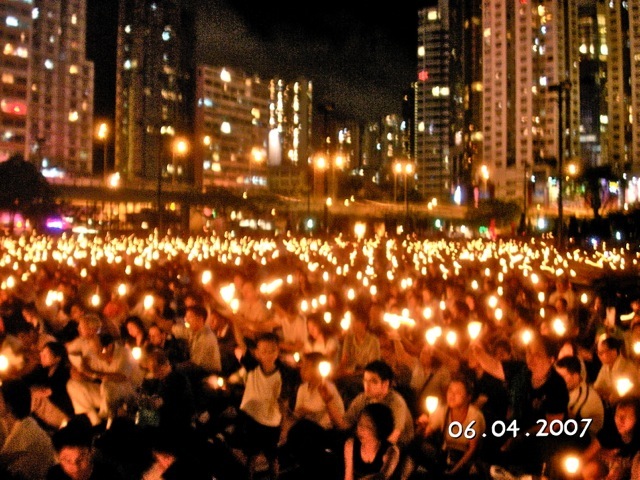 For 20 years, I joined the annual vigil to remember the Tiananmen Incident. 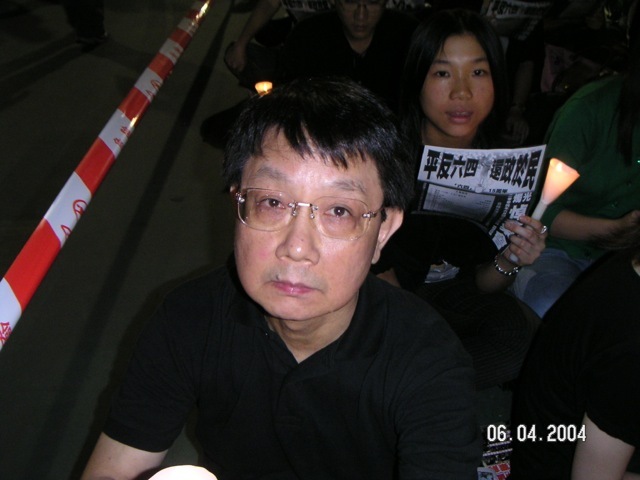 Nowadays, the Hong Kong vigil is the only one allowed on Chinese territory. Hong Kong was obtained by United Kingdom as a war booty of the Opium War to protect British illicit drug cartels. Hong Kong was returned to Chinese rule in 1997. As part of the transfer agreement, a mini constitution, the Basic Law, was enacted. Hong Kongers would continue to enjoy all the freedoms they had under British system, and universal suffrage would be enacted eventually. The slow pace of democratization spawned a persistent movement demanding democracy. I joined the Civic Party (公民黨) to take part in the push for democracy. To assist Civic Party’s fund raising effort, I manned its booth in a fair ground. Here, I taped a make shift horn to my face to project my voice over the din. 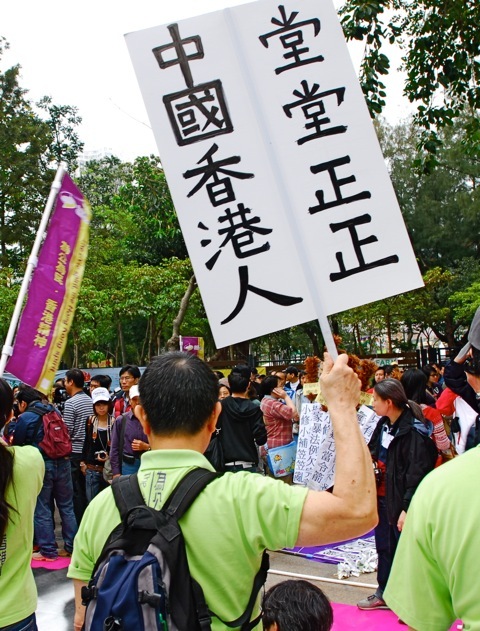 The other side: “Fight for universal suffrage, refuse to be emasculated”. Recently, Beijing declared the rules for the election of Hong Kong’s Chief Executive, the mayor. It stipulated that candidates would be vetted by a nomination committee controlled by Beijing. While pro-Beijing faction considers it a progress since Hong Kongers would be granted the right to vote, others view it as a farce to assure only candidates acceptable to Beijing would run for office. Besides political parties pushing for democracy by winning district elections, others proposed alternative means. 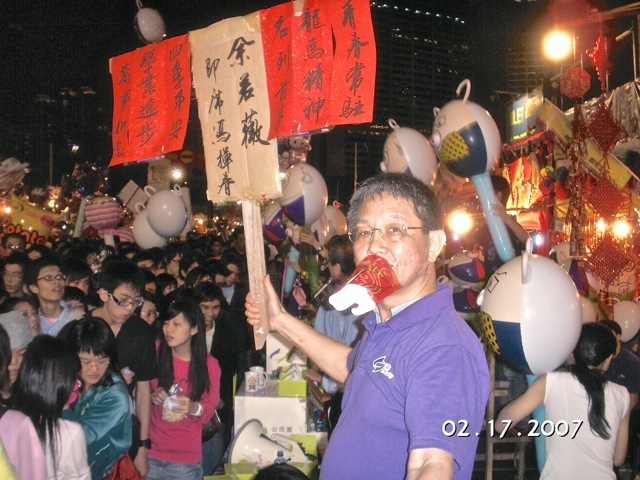 “Occupy Central” threatened civil disobedience if Beijing rules out fair elections. A week ago, students staged massive protests and took the lead in the struggle for universal suffrage. To older democracy fighters, this was a welcomed passing of the baton. 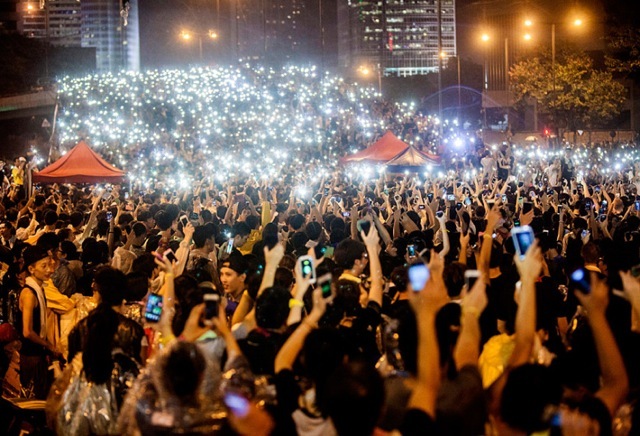 The young protesters raised their cell phones as they sang during the protest. 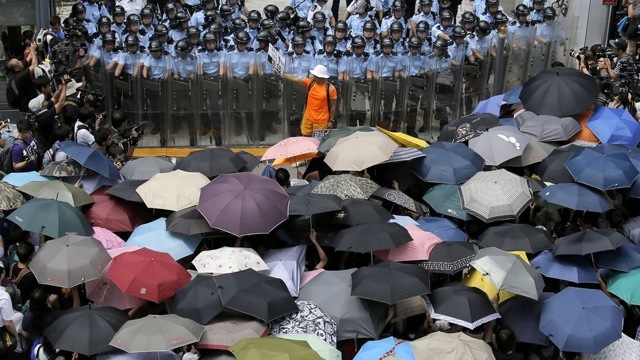 They carried umbrellas to protect themselves against Hong Kong’s ferocious sun, thunderstorms, and police pepper sprays. Protesters under umbrellas faced a line of police. 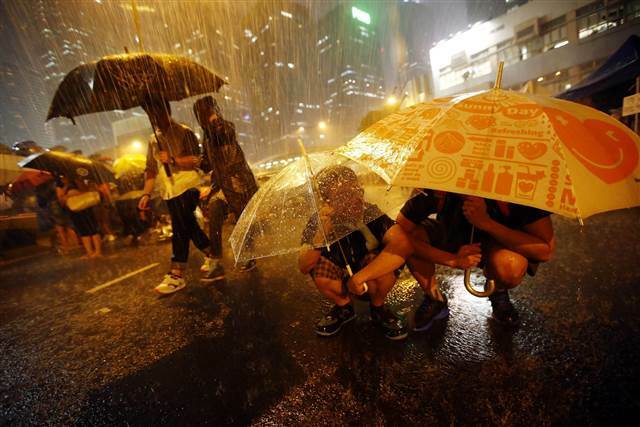 Some named this movement the “Umbrella Revolution” which is counterproductive. The students are not trying to overthrow the government which would sting Beijing into convulsive reaction. 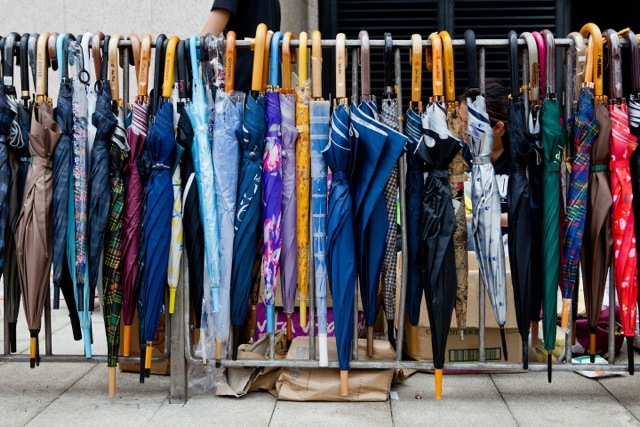 It should be more aptly named “Umbrella Movement” for seeking a fair election process. 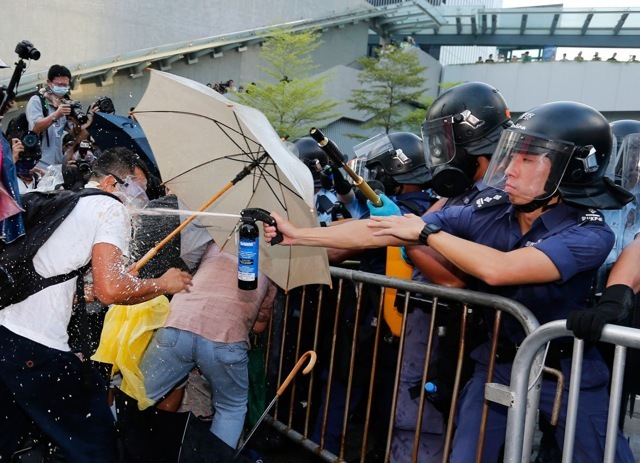 The umbrellas are not always effective protection against pepper spray. 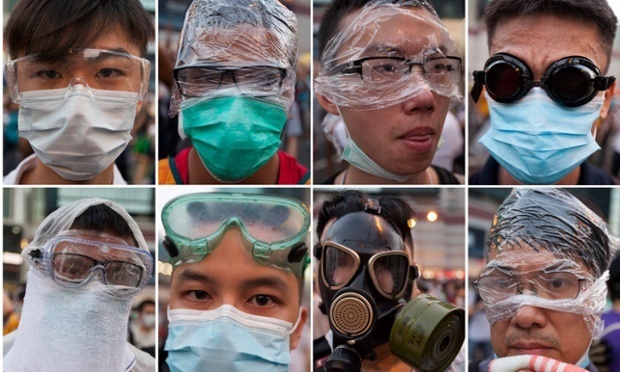 To protect against pepper spray, protesters wore goggles, face masks and plastic wraps. Donated umbrellas lined up for the taking. Police fired dozens of tear gas canisters to disperse the protesters. This precipitous gassing caused a backlash and many thousands more joined the protest. The police backed down and withdrew their tear gas guns. A taxi driver raised his thumb in support of the protests. 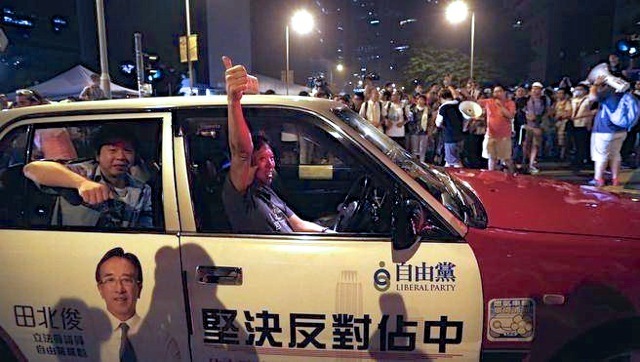 Ironically, he was driving a taxi advertising opposition to “Occupy Central” by the conservative party wrongly named “Liberal Party”. 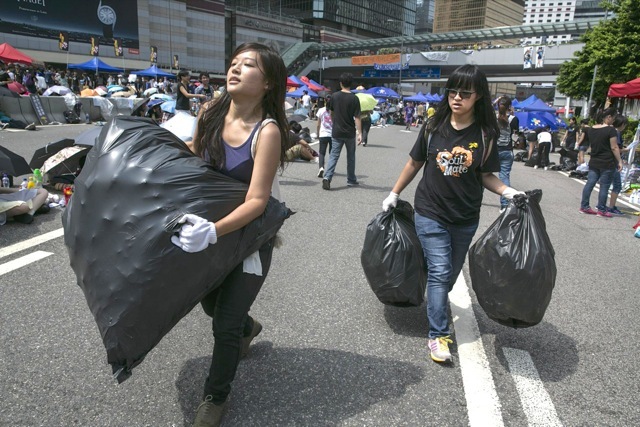 Demonstrating Hong Kongers’ sense of civic responsibility, protesters cleaned up the streets, separated recyclables, and carted away trash. With tens of thousands of passionate protesters in a crowded city, not a single window was broken. They are truly civil civil-disobedients. After a week of civil disobedience and occupation of the streets, the Umbrella Movement faces hard choices. 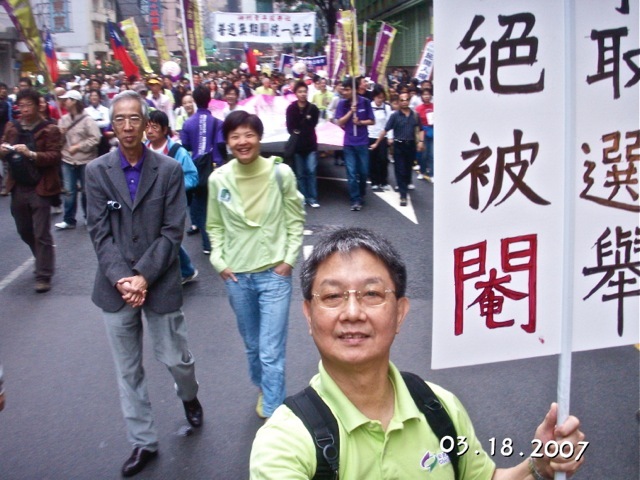 It is generally felt that Beijing will not retreat from its proclamation of Hong Kong’s election process. The fluid situation can develop in unpredictable directions. 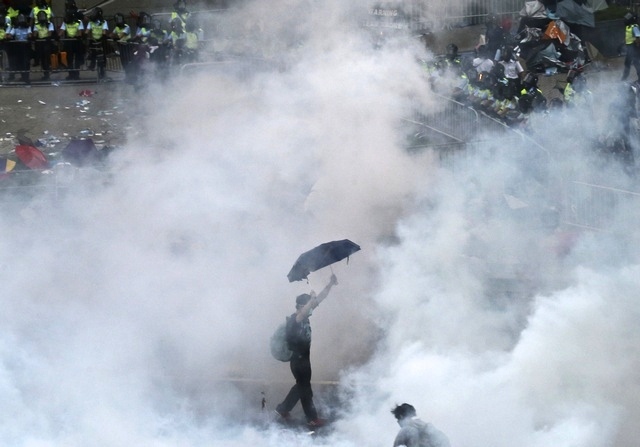 *Hong Kong government waits for the protesters to wear down and dissipate. *Pro-Beijing citizens may oppose the disruptions and clash with the protesters. Some already have attacked the protesters yesterday. This would be dangerous in tearing the society apart. *Strong police action disperses the protest. *A negotiation leads to a compromised resolution. 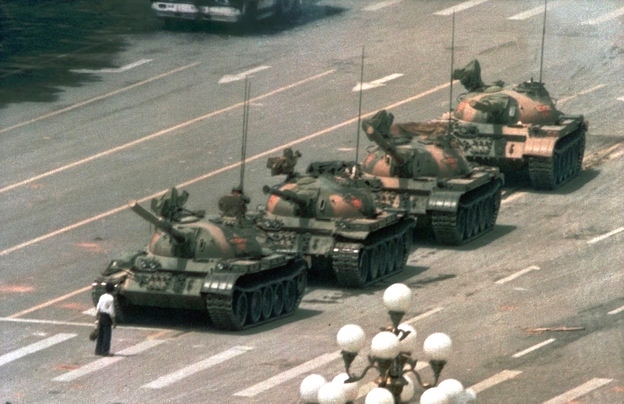 *The worst case scenario: Beijing sends in troops to quell the protest. This can be a repeat of the tragic June 4 incident 25 years ago. Nobody wants to see any martyr sacrificed. Perhaps smart Hong Kong will develop an ingenious compromise. A practical proposal has been floating that warrants consideration: While the pro-Beijing nomination committee of 1,200 nominates 2 or 3 candidates, a winner would be declared only if he/she wins over 50% of the votes. This is negative universal suffrage, but it would empower Hong Kongers with a veto power over objectionable candidates. I am retired and have left Hong Kong. Otherwise I would have joined the protest. Posted by Robert Wu on Saturday, October 4, 2014, at 3:19 pm. Filed under Uncategorized. Tagged 1. Follow any responses to this post with its comments RSS feed. You can post a comment or trackback from your blog.